Preheat your oven to 350º F and line a 9"x9" baking pan with parchment. In a large mixing bowl beat the butter and shortening together. Add the brown sugar, baking soda, salt, egg, vanilla and peppermint extract, beat until fluffy. Stir in the flour until the dough comes together, fold in the mini chocolate chips and crushed peppermint candy. Press the mixture into the prepared baking pan and bake for 16-18 minutes, until lightly golden. To a small microwave safe bowl add the 2 Tbs of chocolate chips and coconut oil, melt for 30 seconds, stir until smooth. Using the edges of the parchment remove the cookie slab from the pan and slice into 12 equal squares. 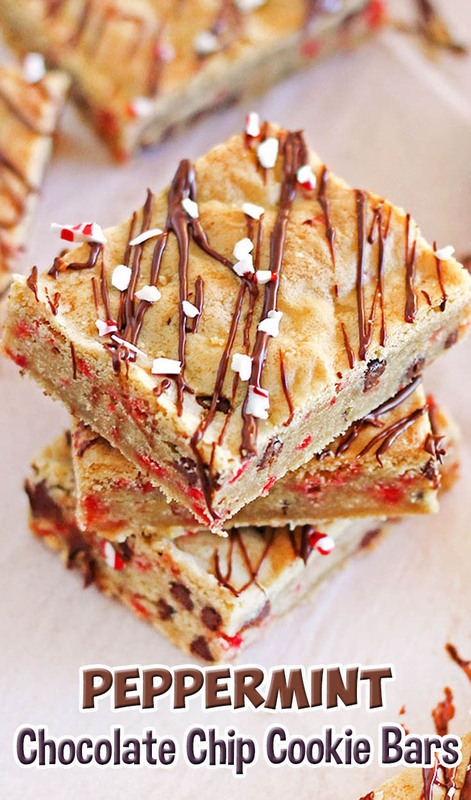 Drizzle the melted chocolate over the top and sprinkle on the 1 Tbs of crushed peppermint candy.